Inheritance protections plans are a specialty of our firm. They help ensure that a family business or significant asset is properly protected when it is transferred from a parent to an adult child. Often, families are not aware that a family home or company can be lost should the child’s marriage break down. But a properly drafted marriage contract can ensure that a valuable asset stays within the family, and having this contract in place can save the child a great deal of time, money and stress in the event of a divorce. Our Inheritance Protection Plan equips parents with the information and tools they need to understand what a legally binding contract looks like, when and how to address marriage contracts with their child, and what the parents’ responsibilities are. 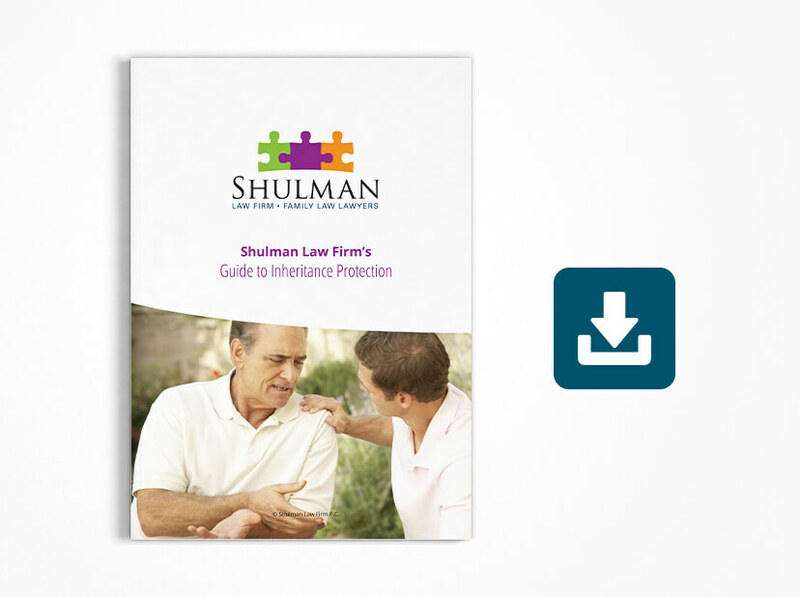 Download Shulman Family Law’s Inheritance Protection Guide, or book a free consultation with one of our lawyers if you or your child would like to learn more about how to best protect your family assets.